You know those ridiculously hot summer days? the ones where you dread cooking anything for dinner that involve heating anything on the stove or preheating the oven? I know these are the times that other folks head outside for their grills - but for city-dwellers such as myself, this is not an option. Compound the lack of grill with the stuffy, humid conditions often present in a pre-war brownstone, and you've got yourself primed for a 2 hour wait for a dining-in.com delivery. Now, I'm in no way saying this is cheaper than dining-in...because I really am not sure? But I'll add it up and get back to you... it does save you the trouble of tipping someone - and the wait, because damn it, if this isn't one quick recipe. It is my understanding that panzanella is Italian (duh) and was invented as a way to use up day old bread....as a side note, I love this ingenuity. It isn't exactly only used by Italians, because my Portuguese family does this kind of thing all the time- throwing away food is absolutely unacceptable. I think it just stems from a peasant culture...use what you've got! 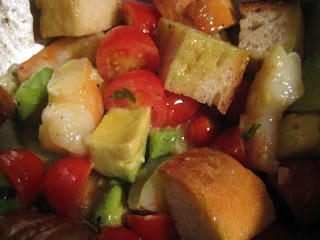 This is a bread salad that combines some of my very favorite flavors of summer: Shrimp, tomato, avocado, bread, and garlicky-lemony dressing. I started with the bread. This was baguette from Trader Joe's. The bread was pretty fresh, so I did toast it for just a second for it to get hard. It doesn't need to get any color, you don't want to chip a tooth, but it just needs to dry out a bit. If you plan ahead, you can just leave the bread out while you are at work. 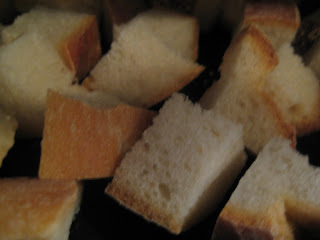 Cut it into 2 cups worth of cubes. I made them a little big for this recipe, but in the future, I would make them a little smaller. Three quarters of an inch would probably be good - but bite sized. 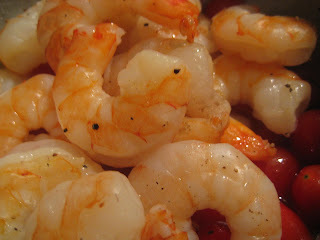 Next step was the shrimp - when its super hot, I just buy the frozen pre-cooked shrimps and defrost them under running water, but you can roast them (my preferred cooking method), boil them, grill them, pan fry them - whatever your heart desires. I just made this last night for dinner. It was sooo good. I didn't have enough olive oil so my did taste a bit lemony so I threw in some balsamic vinaigrette - it tasted pretty good. Next time I think I'm going to add some cucumbers + onion - but this was realllly good!